February. 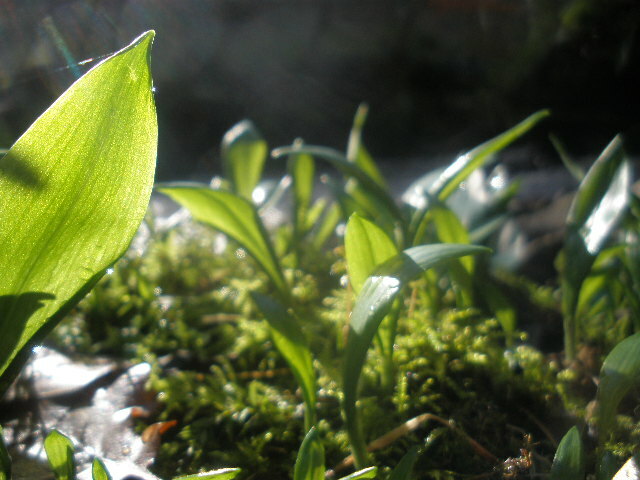 The bright green tips of wild garlic are starting to emerge, one of my favourite foraged greens and a lovely reminder that Spring is on its way! 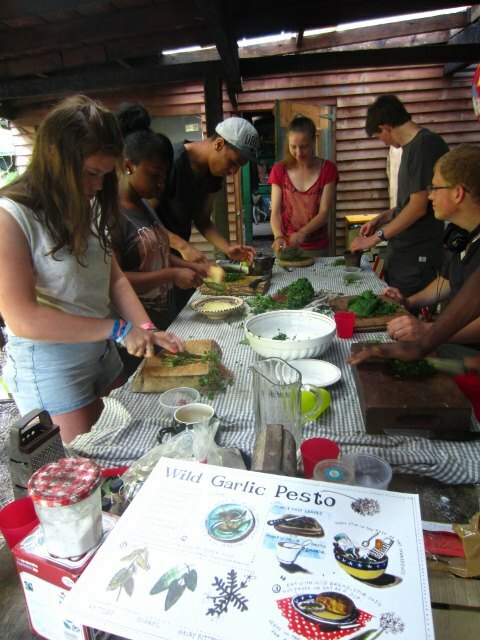 All parts are edible – the leaves, flowers, bulbs and seeds. 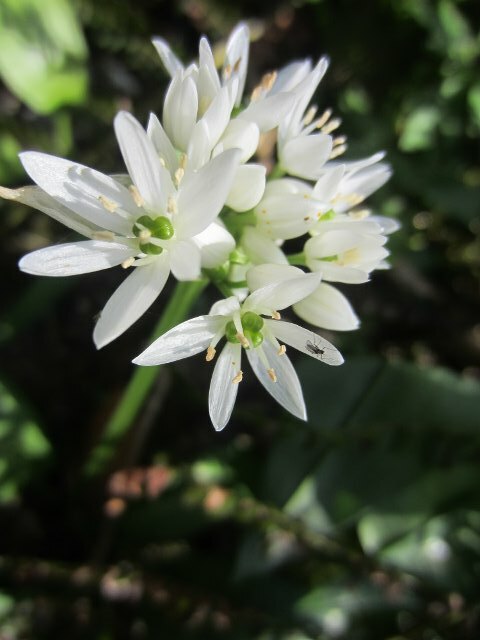 Many people know it as ramsons and I have also heard it called bears garlic: Legend has it that as bears awaken from hibernation they hungrily search out the bulbs, dig them up and feast on them to Spring cleanse their systems. These first tips are the tastiest and the tenderest. 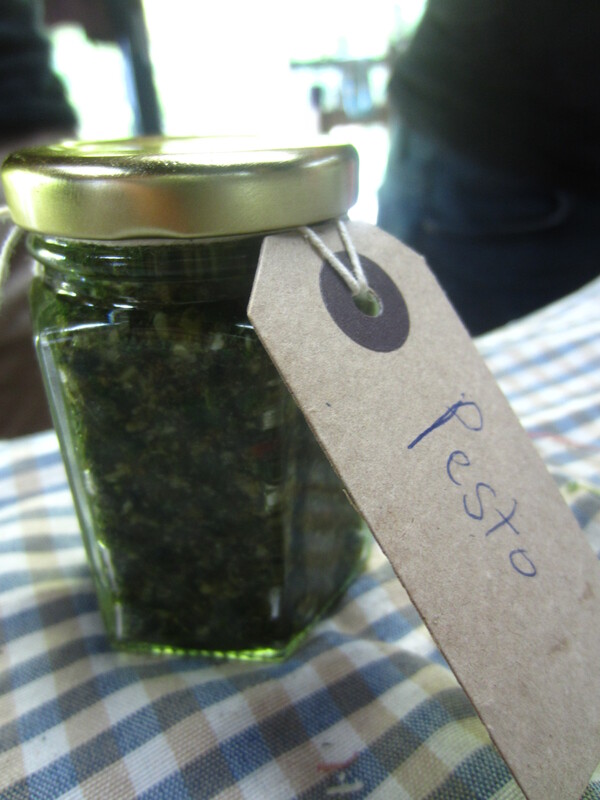 They are delicious finely chopped and sprinkled into sandwiches, or made into wild garlic pesto (recipe below) As they mature I use them by the handful, in stir fries and with pasta sauces. 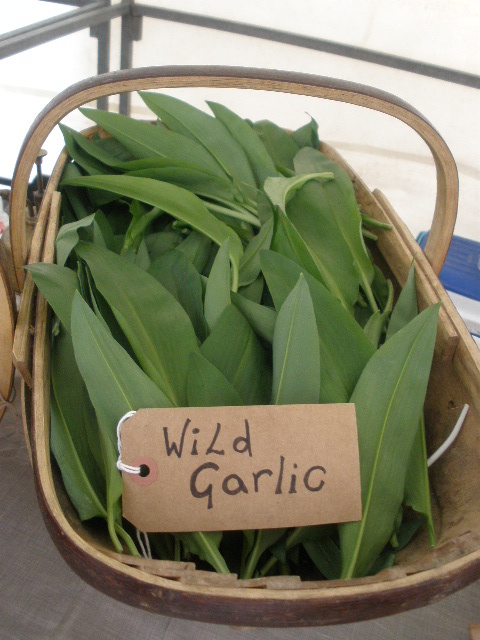 Cooking them really softens their pungent garlic flavour and means you can use them liberally as a spring green. To pick them just nip out the tips with your nails, or snip with scissors. The leaves will quickly regrow. I usually find them by the moist and shady banks of the river in deciduous woodlands, often in carpet like swathes and often alongside bluebells so take care not to accidentally pick bluebell leaves as you are gathering them! The pretty white star shaped flowers also have a strong garlic flavour and look lovely sprinkled on top of salads or used as a garnish. 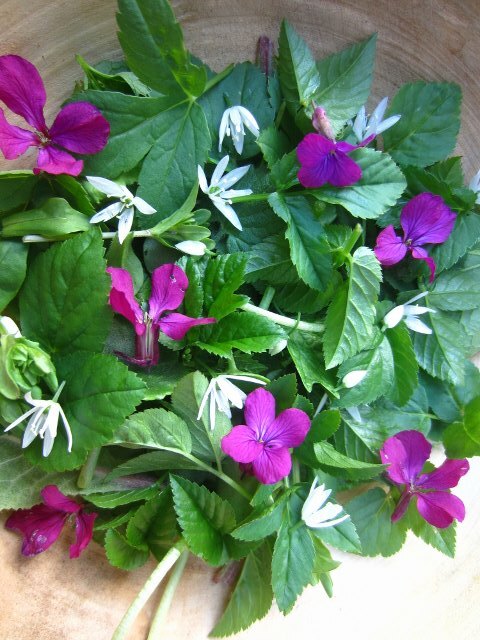 A wild Spring salad, from last May, with wild garlic flowers, honesty flowers, and a mix of foraged leaves. The crunchy green seed pods can be pickled in vinegar. As the seeds ripen they turn black and become very hard, at which stage they can be ground in a pepper mill and used as a garlicky condiment. 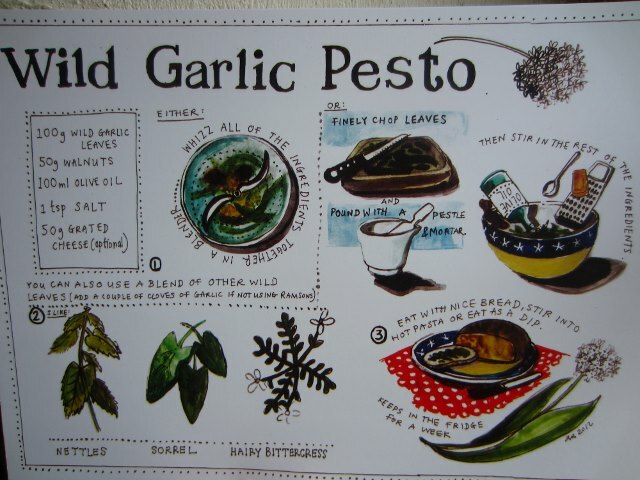 My favourite way to use wild garlic is in pesto, here is my recipe, beautifully illustrated by artist Lizzie Spikes and available for sale on Etsy! Autumn is here already and although in my neck of the woods much of the wild fruit is not as bountiful as last year, there is still a great deal about if you go looking for it. As a forager, October is both one of my busiest and favourite months of the year. On a sunny day, when the light is warm and golden there is nothing nicer than a wander through a favourite nature spot, where the trees are plump and fruitful, a time of plenty before the Winter sets in. Autumn fruits are packed full of vitamins and flavour. For modern palates which often prefer sweetness to bitter or sour tastes, eaten straight from the tree or bush they can be quite sharp, or, if you have ever popped a raw sloe in your mouth, eye wateringly astringent. Lightly cooking them with a little sweetener draws out the juices and makes the most of their rich and complex flavours. If you are lucky enough to live by the coast, you may have come across Sea Buckthorn, the orange berries of which seem to be an acquired taste but I found their sour tartness mouth wateringly good and from reading up on their heath benefits they are cram packed full of goodness, an incredible super food. Picking them is a bit tricky – they are surrounded by a thorny armour and not long after they become ripe burst as soon as they are touched and exude bright orange juice everywhere. Holding a bowl underneath them to catch the delicious explosion seems to be the best way of harvesting them! Gathering Rosehips also involves careful manoeuvring around thorns but they are well worth the effort. A jelly or syrup made from them and spooned over porridge on a cold Winters morning brings an amber glow to the belly and is like a ray of sunshine. All rose hips are edible – the mandarin shaped soft hips of the Rosa rugosa are the first to ripen, with the harder hips of the native dog rose needing a good blast of cold weather to soften them up. Which ever variety you use they need to be minced and sieved very finely (though a jelly bag) to remove the irritating hairy seeds which are in the centre and have pretty much the same effect as itching powder! Elder trees produce clusters of juicy dark berries which are reputed to be wonderful for treating cold and ‘flu symptoms. They need to be heated gently, as the raw fruits contain toxins which can cause upset stomachs. They also make an incredible Port-like wine and I have a couple of demi johns bubbling away for drinking next Winter. Crab apples are often ignored because raw they are incredibly sour, though you may come across a ‘wildling’ which will be sweeter (this is a tree which has grown from a pip, not the true crab apple, Malus sylvestris) but when they are cooked and mixed with sugar, alchemy takes place and their flavour is transformed. They are very high in pectins and adding some to jams or jellies will not only taste lovely but also help them to set quickly. The recipe below is perfect for making the most of whatever fruit is available to you and is suitable for all the fruits above. Measure the juice and return it to a clean pan. Gently heat and add 750g sugar for every litre of water. Once the sugar has dissolved and the juice begins to simmer take it off the heat – if you allow it to boil too furiously it may set like jelly (I have done this before, it is delicious but you won’t be able to get it out of the bottle easily) pour it straight into hot sterilised bottles. It will keep unopened for a good few months, just pop it into the fridge once you have unscrewed it. This is delicious made into a drink, drizzled onto pancakes, icecream, porridge or yoghurt and makes my favourite champagne cocktail!